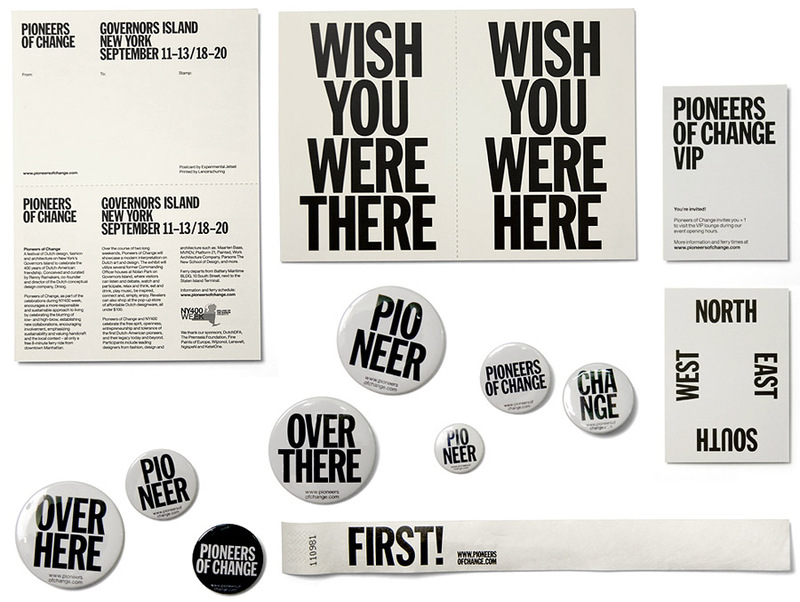 Taking place during two weekends in September (Sept 11–13 and Sept 18–20, 2009), Pioneers of Change was a group exhibition organized by Dutch design label Droog, on the occasion of NY400 (a festival celebrating the 400-year relationship between Amsterdam and New York). Inside and around twelve abandoned officers' houses on Governors' Island (NY), a number of Dutch product- and furniture-designers presented their projects. For this exhibition, we designed all printed matter (invitations, flyers, brochures, etc. ), the sign system, and the website. 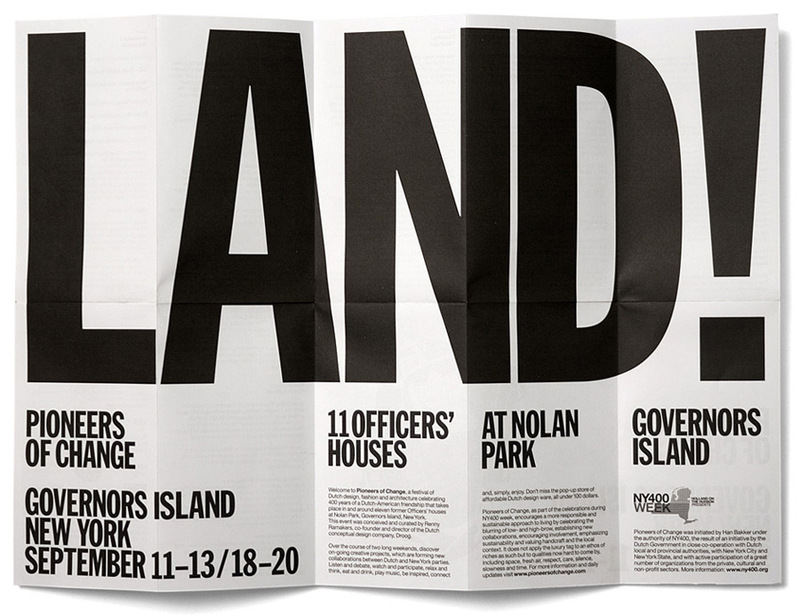 The main theme behind the NY400 festival (of which Pioneers of Change was a part) was the fact that, in 2009, it was 400 years ago that the Dutch set foot on New York (and named it 'New Amsterdam'). So obviously, there's a whole historical, geo-political (and also colonial) dimension to this story. Thinking about this whole history, we thought it would be good to refer quite openly to the gesture of exploring, claiming and mapping land. We also wanted to refer to the original meaning of the word 'pioneer': "a person who is among the first to explore or settle in a new area". That's why the graphic identity we created revolved around notions such as land, distance and mapping. One of the first sketches we made was the photo-montage shown above. 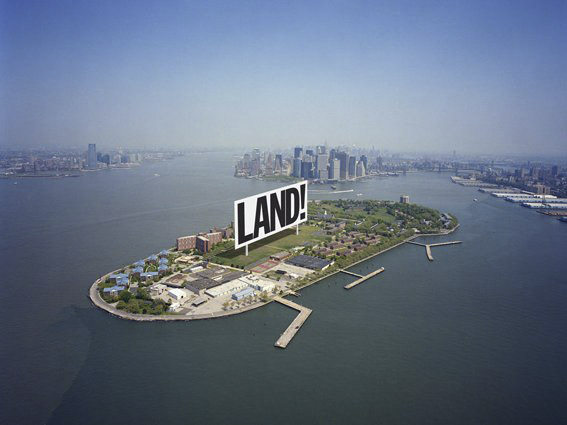 A gigantic billboard, erected on Governors' Island, proclaiming the word 'Land!'. On the one hand, this word refers to the excited screams of sailors, when confronted with the sight of land after a months-long journey on sea. On the other hand, the billboard also referred to the act of claiming land – after all, by labeling it, you own it. Obviously, this billboard was impossible to realize (especially within the small budget we had to work with). So it was never actually executed. But it did provide us with a good starting point, and it was an image we could later use for press- and promotional purposes. One of the main parts of the graphic identity was the signage. In short, we were asked to come up with a graphic intervention that would visually connect the 12 abandoned officers' houses, situated around a large lawn. Thinking about lawns, we thought it would be a good idea to look at the signs you sometimes see on suburban lawns: these wooden boards, displaying phrases like 'For Sale', 'For Rent', etc. Again, we thought these signs had a lot to do with claiming land, and owning property. 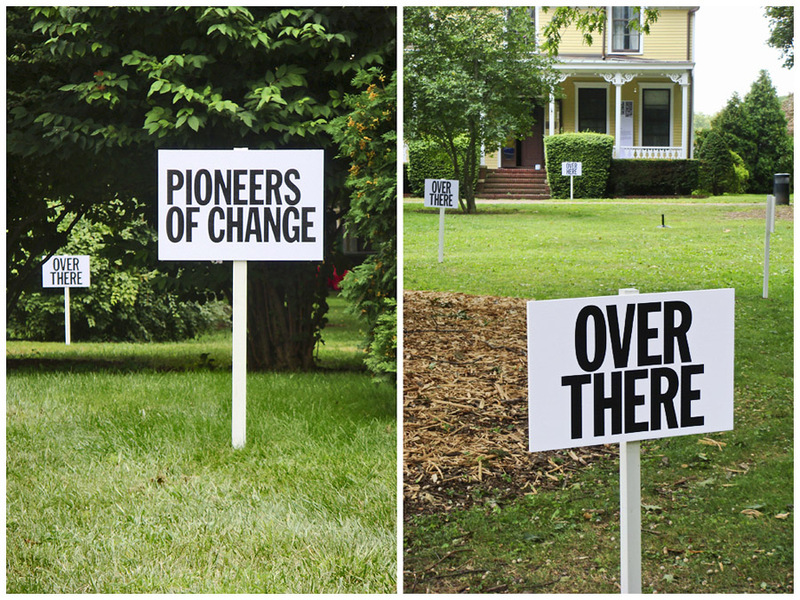 So we used this simple system, of lawn signs, to create a very rudimentary, almost abstract form of signage: boards that only said 'Over Here' and 'Over There' (we also added a couple of signs that just displayed the title of the exhibition: 'Pioneers of Change'). 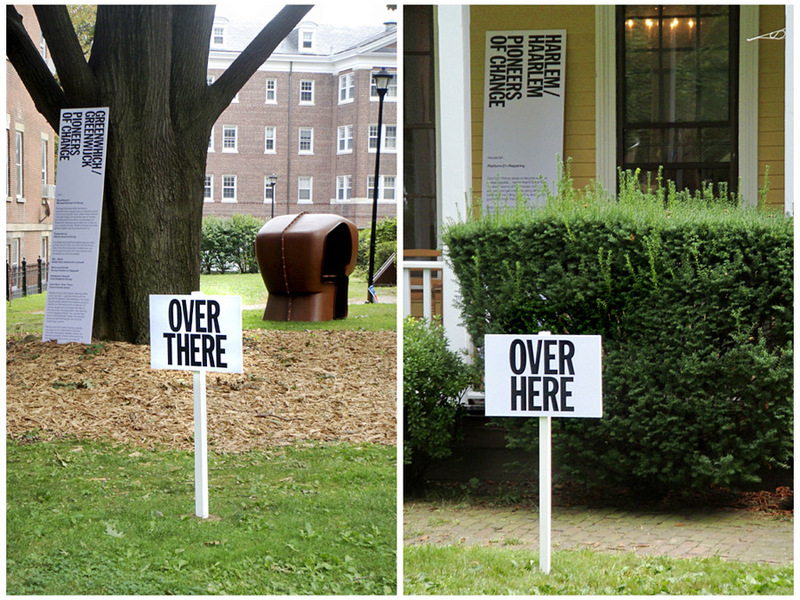 These signs functioned mainly to make clear, to the visitor, that something was happening on and around that lawn. But the boards also functioned as a route, pointing visitors the way from the ferry to the lawn (and back again). We actually hammered all the signs in the lawn ourselves – eighty of them. Which was easier said than done; apart from the fact that the ground was hard as a rock, it was also slightly illegal to install these boards. We were informed that we were only allowed to pierce into the ground for a couple of inches, as anything deeper would be too dangerous – apparently, the ground was filled with ammunition (after all, Governors' Island used to be an army base, between 1776 and 1966). Obviously, we had to drill a lot deeper to install these boards. For the printed matter, we wanted to refer to this whole notion of claiming and mapping land as well. First of all, here's the invitation, which consisted of an A3-sized sheet, folded to a 8.5 x 14.5 mm format, in such a way that the folded booklet resembled a map. As for the other items – we show them here together, as a sort of 'group portrait' of printed matter. On the very right, you can see a sort of little VIP-pass (front and back), that was sent out together with the personal invitations. We designed this item as an A7-sized card, to be included with the map as a sort of abstract compass. As a hand-out flyer, we created an A5-sized card (front and back), perforated in such a way that it could be used as two separate A6-sized postcards. For the design, we were inspired by the iconic 'Wish You Were Here' postcard greeting. To emphasize the sense of place, we complemented this slogan with its antithesis: 'Wish You Were There'. We were also asked to design a wristband (for visitors to wear during the opening reception). Obviously, this wristband/bracelet functioned as a way to make sure that the people getting drinks were of the legal drinking age. The word 'First!' refers to the overall theme (claiming land, being the first to do so, etc. ), but also to a more phonetic (and alcoholic) use of the word: Thirst! Lastly, We also created some buttons/badges, to hand out during the opening reception. The words on these buttons referred again to the wooden signs on the lawn: 'Over Here', 'Over There', and 'Pioneers of Change'. Added to that, we also designed some press releases, some PDFs, some adverts, and all kinds of other small items (not shown here). As for the printing: the invitations, the VIP-card, and the flyer were all offset-printed by Lenoirschuring (Amstelveen). (The bright, almost 'day-glo' colours of both the price tags and the window lettering might seem a bit out-of-tune with the black-and-whiteness of the rest of the graphic identity – but that was on purpose. We were specifically asked to give the store a somewhat separate graphic tone). As for the project as a whole, we'd like to thank Renny Ramakers, and the rest of the crew at Droog Design, Governors' Island and NY400.